Summary: In Secret Empire #7, things seemed to have reached their darkest. Hydra under Steve Rogers had killed Black Widow and recovered all the pieces of the Cosmic Cube that the Underground had gathered up. The remaining heroes had pretty much given up the fight as lost. This issue starts with the AI Tony Stark contemplating a birthday cake. Earlier that day, Steve Rogers gave a speech declaring war on Wakanda and New Tian (a mutant colony in what used to be California). New Tian’s true leader is revealed, Emma Frost. But she refuses to surrender to Rogers. She is willing to give him her fragment of the Cosmic Cube as a gesture of goodwill, but vows “No mutant will kneel.” In Wakanda, Doctor Faustus has managed to mind control most of Wakanda’s forces forcing a quick defeat of Black Panther. But even in defeat, Black Panther stands defiant. 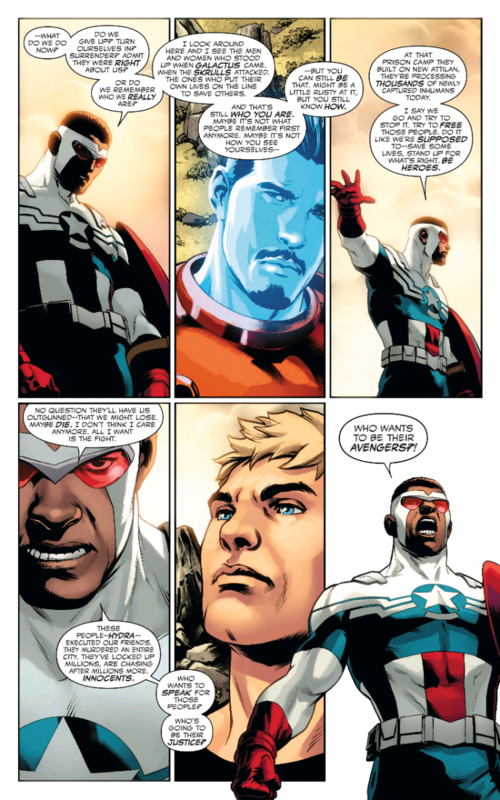 In Nevada, Sam Wilson gives another speech, trying to rally the last vestiges of the heroes together. Sam knows they have very little chance of winning, but he wants to go down fighting. He convinces the heroes that they need to avenge their friends and the civilians who have died under Hydra. They decide to make a go at liberating the Inhumans from Hydra’s containment camp. When they arrive, they discover that the Inhumans are already trying to break free. They discover an Inhuman named “Barf” who has the ability to puke up helpful items. He puked up the keys to help the Inhumans escape. AI Tony gets him to puke up a Cosmic Cube fragment. This brings us to where the issue started. AI Tony calls everyone together. He realized how Steve Rogers was able to stop Spider-Man from killing him (breaking free of Ulysses vision of the future). He had a fragment of the Cosmic Cube. The heroes had believed that they needed the entire Cube to cause any changes, but even one fragment can cause small tweaks to reality.,.like making that cake appear. AI Tony starts to come up with a plan. Meanwhile, in Atlantis, we found out that Namor hasn’t really been in Roger’s pocket this whole time. He’s been working in the shadows with Bucky, who turned out not to be dead after all. And Bucky has a plan of his own. Review: To fully appreciate this issue, you need to read SECRET EMPIRE #8 right after you read it. But, there are still quite a few things I wanted to discuss about this particular issue. One of the biggest problems with Marvel’s big events is that they tend to feel dark and without hope. But the theme of this particular issue was about finding hope in the most unlikely places. Emma and Black Panther showing strength even in defeat. AI Tony finding inspiration in a birthday cake. Namor revealing that Bucky was alive the whole time. And the most interesting to me, a lowly Inhuman with vomit-based powers being the character who started to turn everything around. 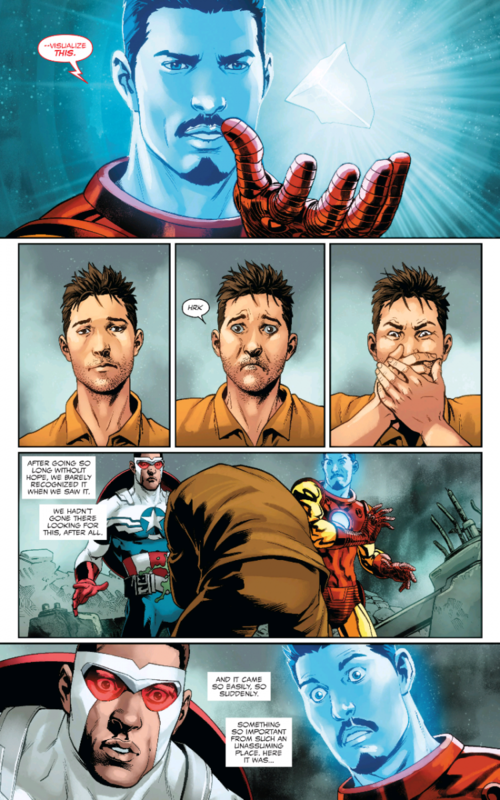 This is just a very well-planned out comic, and shows that Marvel and Nick Spencer knew exactly what they were doing in all the build up to get us to this point. I also loved the parallels between Steve Rogers’ speech and Sam Wilson’s speech. When Steve gives his speech, it really just feels like more of the same. Marvel heading to a really dark place with Steve Rogers driving the train. But, when Sam gives his speech, it feels like things are starting to turn around. 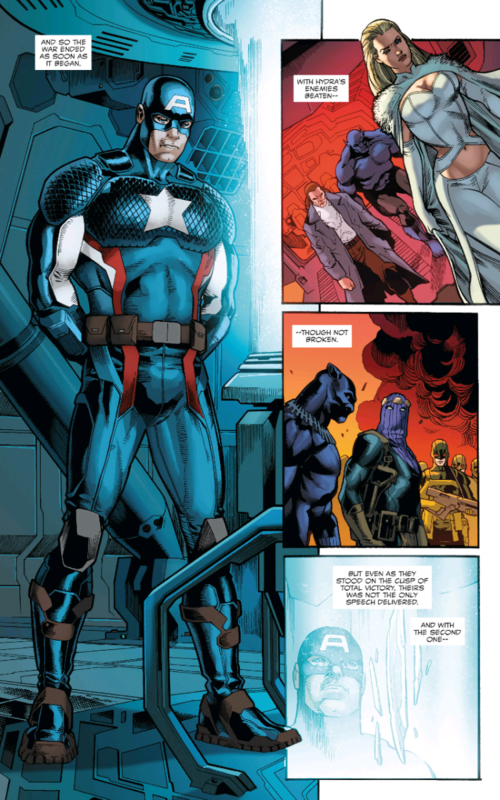 I genuinely felt this was the moment where Sam really made being Captain America his own...which is kind of sad since it seems he will be going back to being Falcon during LEGACY. But I hope the character continues to trumpet the heroic spirit that should be so core to the Marvel universe. The art on this comic was great too. All of the characters are drawn perfectly, and Jesus Saiz and company manage to get every possible emotion on the page. When I was flipping through this comic for a second time to worth on this review, I was amazed by how much detail we got on each character’s face in pretty much every panel. Even the little things like Barf’s facial expressions (not to mention the reaction shots from AI Tony and Sam) were just perfectly done. I know a lot of people are down on Marvel for a lot of reasons. But there are always a lot of Marvel books I enjoy each month. That said, this issue promises a bold new optimistic direction for the Marvel universe. I definitely hope they follow through with that. If so LEGECY will truly be something special. Kind of sick of Emma Frost, but that is purely personal preference. Yes, definitely. In the history books, if Marvel keeps moving in a more positive direction, this book is going to go down as WHEN IT ALL STARTED. This and SECRET EMPIRE #8 are the two best comics I’ve read in a very long time. 62% Off on 2ch Batman DC Comic IR Helicopter only $30 (was $79.99) after Coupon Code with Free Shipping. Enter MGAUGUST2017 at Shopping Cart to get Discount.